This is the perfect tea for a rainy day. The dry leaf smells sweet and soft, with a bouquet of cool rainy air, apples, flowers, and vanilla. The liquor aroma is strongly vegetal but with enough floral sweetness to keep it balanced, while the flavor is more the opposite; floral and sugary-sweet with a slight veggie backbone. There is a lingering, subtle, sweet aftertaste. 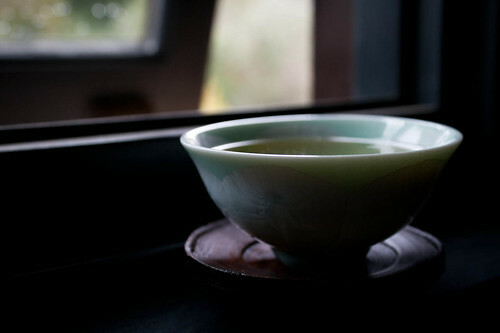 The cha qi feels sedating but is thankfully not too heady, so there is no headache and only a bit of tea-drunkenness. Brewing this tea is remarkably easy; I would have expected the amount of neglect and abuse I inflicted to be unforgivable (if not borderline criminal), but most of my over-steeps were actually pretty delicious.